When I lived in England, one summer I went to Birmingham to visit my cousins for a few days. 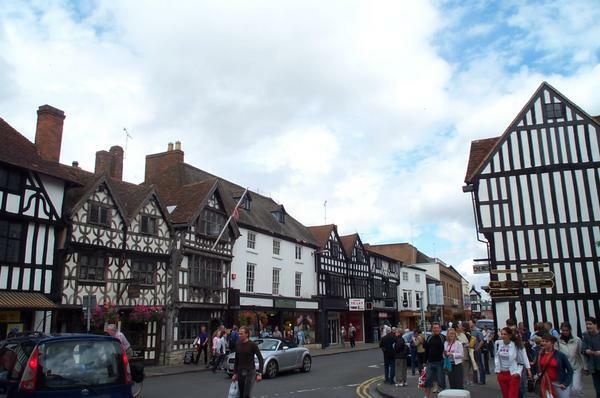 While there, two of the girls, Ellen and Mary, said, "Tomorrow we are going to Stratford-on-Avon, Shakespeare's country." Of course I was delighted and we did go. What a wonderful day we had. 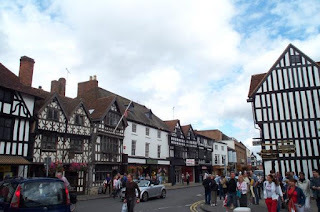 Downtown Stratford-upon-Avon. Photo by Kaihsu Tai from Wikipedia. It was just one of these sorts of ancient buildings I stayed in. First off, we went into Shakespeare's home and saw the room he did most of his writing in, a small room, his desk and chair quite small, but very impressive. We also saw his garden and Anne Hathaway's home. After lunch we went to the theatre, to see how grand it was, and admired the swans swimming in the River Avon. Then we had to buy our tickets for the evening show, "Anthony & Cleopatra," I was thrilled. Before the show, to get a good seat, you had to pay for a "queue stool" for 1 shilling and 5 pence. Then came about 2 hours of waiting (first come first served sort of thing.) We finally got in, up in the first gallery, and watched a very splendid performance. I can still see it all, in my mind. Then we got a late bus or train back to Birmingham, very tired but happy. What a lovely day we had. Letty was in England 1944 to 1953, but it is unlikely that this trip happened after I was born. Could it have happened in wartime? Possibly, but I doubt it. I date this adventure to between 1945-1948. I too had an opportunity to visit Shakespeare's birthplace in 1970, when I stayed the night in a hotel from Shakespeare's time. The floors canted at crazy angles and the whole place looked ready to collapse, but it was an experience I'm glad I had.